Then she has a baby and she dies. Or that's how it seems most non-PWDs and non-T3s remember the movie. Steel Magnolias came out in 1989, a mere four years before my diagnosis. Back then, I'd get a lot of "Oh! Like that movie!" reactions when people heard I had diabetes, and it drove me absolutely bananas. Yes, I have lows but what you saw was a movie "reenactment" - I've felt like crap, I've shaken like a leaf, I've sweat and lost my temper, I've had alllll the symptoms...but I've never had a low like Shelby did. I've also had a lot of people assume I'd never be able to have children thanks to that movie. Big Nan, of course, was a naysayer but even otherwise-supportive friends and family can't get Shelby's death out of their heads. For the record, folks: diabetic women can have healthy pregnancies and can deliver healthy babies. YDMV, naturally, and complications (like my mild non-proliferative background retinopathy) can make pregnancy more difficult and, yes, even unsafe - just like Shelby's was. The fact is that - like most things in life - every person is different and these are always a case-by-case situation. But uneducated people often make incorrect assumptions, and I kind of dreaded "coming out" with my pregnancy for this very reason. I figured it would be the food police times a bajillion, and cringed whenever I thought of the pity-head-tilts or exclamations of surprise/horror/shaming that people would give when they knew I was diabetic and pregnant. Update: If you aren't Shelby either, click here! So keep your head-tilt to yourself, buck-o, and stop judging me and my life by 80s movies. Shelby's life, her choices, her disease have nothing to do with mine. I'm not Shelby, because I'm me. Love it! I've only seen part of the movie but I saw the seizure scene and I remember screaming "You don't give someone having a seizure food!!!! SHE'S GONNA CHOKE YOU IDIOT!" So clearly, not very realistic. I'm one of the few T1s that likes that movie....but the comparisons always annoy me. I love your button! It makes me smile. :) "Diabetics can have healthy babies too!" seems to be a phrase that has become a part of my life as an adult. *love* the button. It's funny, when I was writing my book my editor slashed references to "Steel Magnolias", saying it was too old a movie. I couldn't convince her that people would always get the reference! And that was 5 years ago! Thank you for writing this post! I mean that. I too am newly pregnant (10 weeks now) and I am scared about telling people for the exact reasons you just described. I thought it was just me, thanks for proving me wrong. Great button by the way. 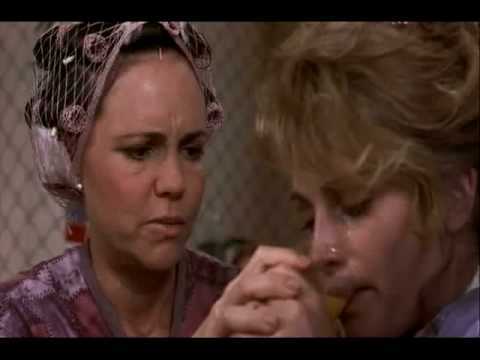 The ONLY Steel Magnolias reference I've gotten so far was before I was even pregnant, and it wasn't bad. I was talking to a close friend about how I was working on getting healthy enough to TTC, and she turned to me with sudden, genuine fear and concern and said, "Wait, it's not going to be dangerous for you like it was for Julia Roberts in Steel Magnolias is it?!" 1. It was a QUESTION. 2. It was said entirely out of love and concern. 3. She was merely relieved and happy when I said, "No, that's not an accurate portrayal of diabetes anymore. The story was already out of date when the movie came out." I love it. I linked to your post from facebook when i posted a picture of the cafepress button. I'm a type 2 diabetic but considered "fragile". My doctor told me my kidneys are not healthy enough to even think about bringing a child into the world. I'd desperately love to have a family but was warned against it. 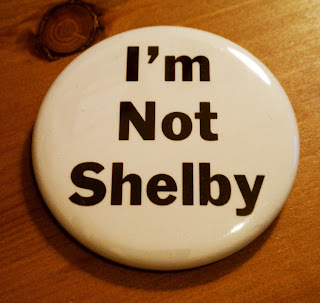 Steel Magnolias hit home with me big time, even though Shelby was type 1. My lows make me ugly - literally. Physically, mentally - not a pretty individual to be around when having a low. You are so blessed to have a family! I'm happy for you!